As you might have guessed from the title we tried some watery techniques today. I love it. Hope everyone else enjoyed themselves too. We didn’t use any pretty papers but made the background ourselves. First we used distress inks to wash the background. Next we added some orange Glimmer Mist, then the fun part, added circles of white ink to replicate the “Bokeh” effect. 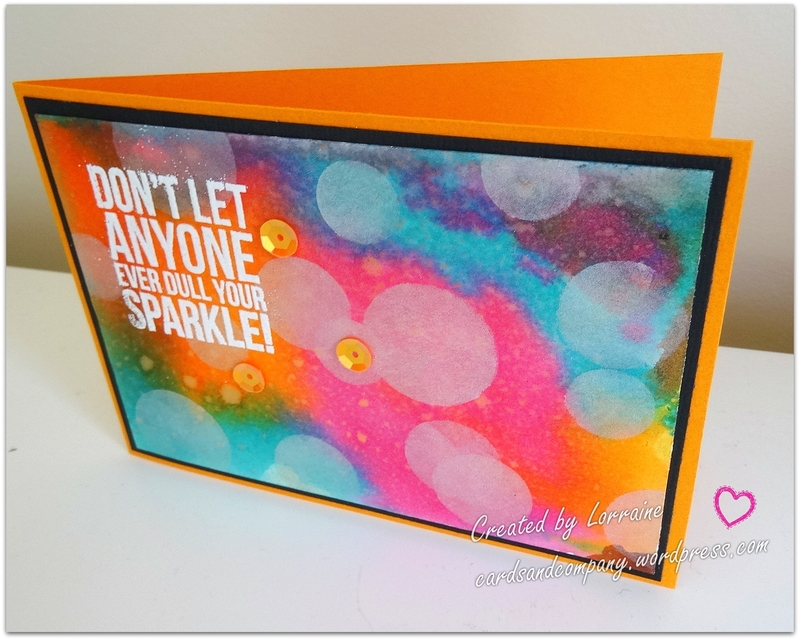 Lastly we heat embossed a sentiment and added a few orange sequins. “In photography, bokeh (Originally /ˈboʊkɛ/, /ˈboʊkeɪ/ BOH-kay — also sometimes pronounced as /ˈboʊkə/ BOH-kə, Japanese: [boke]) is the aesthetic quality of the blur produced in the out-of-focus parts of an image produced by a lens. Bokeh has been defined as “the way the lens renders out-of-focus points of light”. Fun, fun, fun and very sparkly, sparkly, sparkly! That card is FANTASTIC!! I love these vibrant colours and the bokeh effect! SUPER! Thank you Kamila. So pleased to meet you. I’ve had a quick look at your site and I think we have very similar taste in cards. Love your work. I am happy, and yes we do! Thank you for subscribing to my blog!